Cornerback Kyle Fuller wrapped up his fourth season in the Chicago Bears’ secondary following the loss to the Eagles in the wild-card round of the playoffs, and it was arguably the best of his young NFL career. He’s improved in coverage each season thus far, and through his play, he’s helped the Bears develop into the NFL’s premier defense. The modern-day Monsters of the Midway finished as PFF’s top-graded defense at 93.1, and Fuller was a major part of the secondary that recorded the highest regular-season coverage grade by a defense in the PFF era (2006-present) at 95.9. The Virginia Tech product ended the 2018 regular season ranked as the eighth-highest-graded cornerback in the NFL (83.0) and fifth-highest-graded in coverage (84.1), and he achieved that despite seeing the second-most targeted passes come in his direction (105). On those 105 targets in coverage, Fuller allowed only 63 receptions, a 66.6 passer rating, and he tallied 19 combined interceptions and pass breakups, the second-most among cornerbacks. As a result, his production earned PFF second-team All-Pro accolades. Even as a standout on the NFL’s leading defense, Fuller still hasn’t received the respect that he deserves as one of the league’s top playmakers in coverage. Over the last two seasons, he’s been targeted on 224 pass attempts, most among all defenders, but has allowed a reception rate of only 55.4%. In 2017, Fuller led the league with 18 pass breakups, and this season he tied for top honors in interceptions, with seven. This was also Fuller’s second straight season of allowing a passer rating below 70.0. Only two other cornerbacks have accomplished this feat from 2017-2018; Brandon Carr and Xavien Howard. 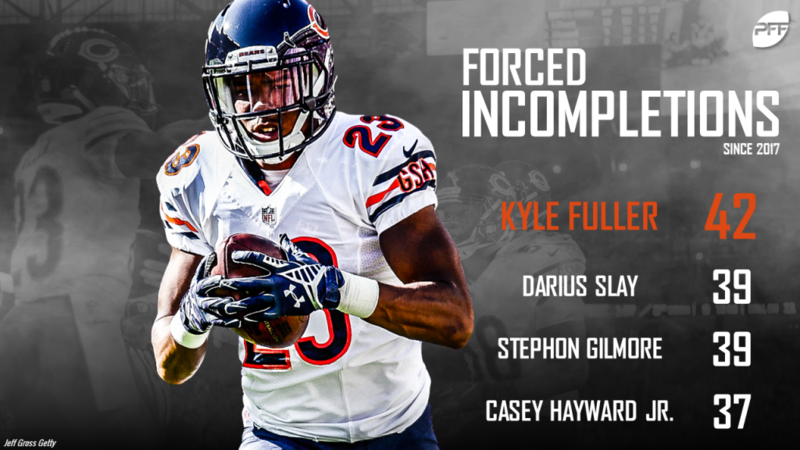 The Bears ended the season as PFF’s top-ranked secondary through the regular season, and it’s easy to understand why. Besides Fuller, the unit also featured PFF’s first-team All-Pro safety Eddie Jackson, but what really separated them from the pack was the lack of a weak link. Every single player that lined up on at least 200 snaps in their secondary – Fuller, Jackson, Adrian Amos, Prince Amukamara, Bryce Callahan, and Sherrick McManis – all earned grades above 80.0. Last March, Chicago wisely locked Fuller up with a four year, $56 million contract through the end of the 2021 season, including $19 million guaranteed. His average cap hit of $14 million will look like a bargain in the coming years if his career trajectory continues to ascend. With many key players likely to return for the 2019 season, it seems likely that the Bears’ defense will remain elite, especially if quarterbacks continue to waste throws in Fuller’s direction.